Tracheotomy and tracheostomy is a surgery on the neck to open a direct path by cutting a hole in the trachea (windpipe). They are performed by paramedics, veterinarians, emergency physicians, and surgeons. Both surgical and percutaneous techniques are now widely used. Tracheostomy was written about in ancient Egyptian tablets, but, in the 12th century, Ibn Zuhr described the first correct tracheotomy operation for people who were suffocating (could not breathe). The current tracheostomy was described in 1909 by Chevalier Jackson, an American doctor. 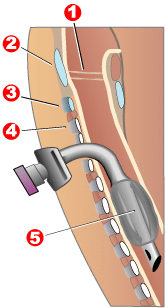 ↑ "Tracheostomy: Evolution of an Airway," Steven E. Sittig and James E. Pringnitz, AARC Times, February 2001. ↑ Prof. Dr. Mostafa Shehata, "The Ear, Nose and Throat in Islamic Medicine", Journal of the International Society for the History of Islamic Medicine, 2003 (1): 2-5 . This page was last changed on 5 November 2013, at 04:20.